Villeroy & Boch (Mettlach, Saarland, Germany, established 1836), designed by Heinrich Schlitt (German, 1849–1923). “2765” Stein, 1902. Stoneware, with colored slip and glaze decoration, and pewter. Milwaukee Art Museum, Gift of the René von Schleinitz Foundation M1962.848. Photo credit: John R. Glembin. Last time, we looked at the historical context for artwork in late nineteenth century Germany. In 1871, Germany officially became a unified country. This time, we’ll look at the cultural ramifications of the unification and how it impacted art. Although German-speaking princes had been allied for centuries, the individual provinces needed to strengthen their commitment in order to counter military and economic competition from other countries such as Austria and France. But just because the people in the new country spoke German and shared much in the way of their cultural identity didn’t mean that they felt like a big happy family. And the disruptive forces of the industrial revolution did nothing to help the sense of confusion and frustration. The people of the German Empire needed to ask themselves: what does it mean to be German? The imagery on Mettlach steins of the time offers some interesting answers to that question. 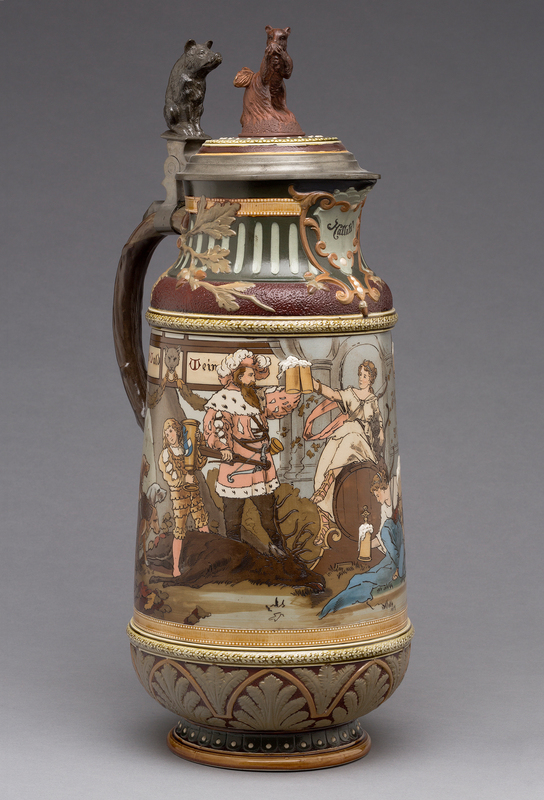 Some steins use inspiration from the distant past for their subject matter. This shows a pride in the traditions of German culture—with roots back to the middle ages—as well as nostalgia for a simpler time. This past is often called “altdeutschen” or “old Germany”. When it appears in art, it is called historicism. 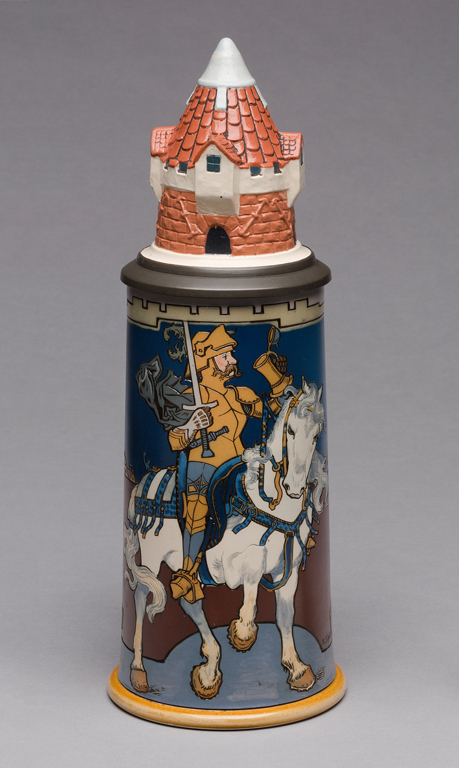 For instance, at the beginning of this post is a beautiful stein that shows a medieval knight mounted on a majestic white horse enjoying a tankard of beer. The romantic notion of the past is echoed in the lid in the shape of a castle turret. This large-scale pitcher shows successful German hunters in extravagant Renaissance dress—just look at that ermine trim! The man on this side is toasted by none other than the ancient goddess of the hunt, Diana, who sits on top of a beer barrel. Villeroy & Boch (Mettlach, Saarland, Germany, established 1836). “2205” Covered Pitcher, 1897. Stoneware, with colored slip and glaze decoration, gilding, and pewter. Milwaukee Art Museum, Gift of the René von Schleinitz Foundation M1962.666. Photo credit: John R. Glembin. A noble couple in elegant dress from the 16th century is featured on this pitcher. The traditions of the past are celebrated by the man who is practicing falconry, using the bird of prey to hunt. Villeroy & Boch (Mettlach, Saarland, Germany, established 1836). “1690” Covered Pitcher, 1889. Stoneware, with colored slip and glaze decoration, and pewter. Milwaukee Art Museum, Gift of the René von Schleinitz Foundation M1962.729. Historicism is not the only way that steins reveal the German exploration of identity. National symbolism can be seen in this Mettlach stein. The Imperial Eagle of Germany is front and center. Villeroy & Boch (Mettlach, Saarland, Germany, established 1836), design attributed to Otto Hupp (German, 1859–1949). “2075” Stein, 1900. Stoneware, with colored slip and glaze decoration, gilding, and pewter. Milwaukee Art Museum, Gift of the René von Schleinitz Foundation M1962.567. Photo credit: John R. Glembin. There is further pride in German modernity: This stein celebrates two very important technological developments that Germany embraced: the telegraph and the railroad. The eagle holds telegraph poles with his claws—you can see the glass insulators at the top of the poles with the lines strung between them. On the eagle’s shield is the winged wheel that represents the German railroad. 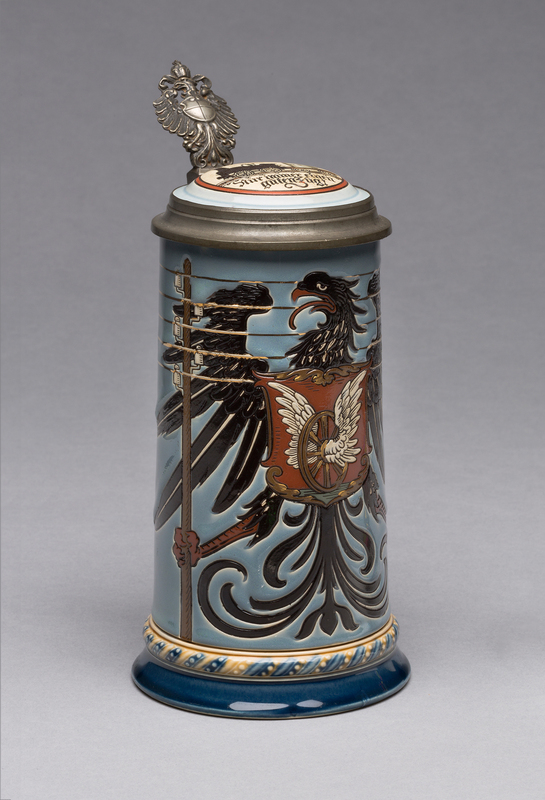 The stein would have been marketed as an “occupation” stein for a man working for the railroad–a way to show pride in your job and your country. 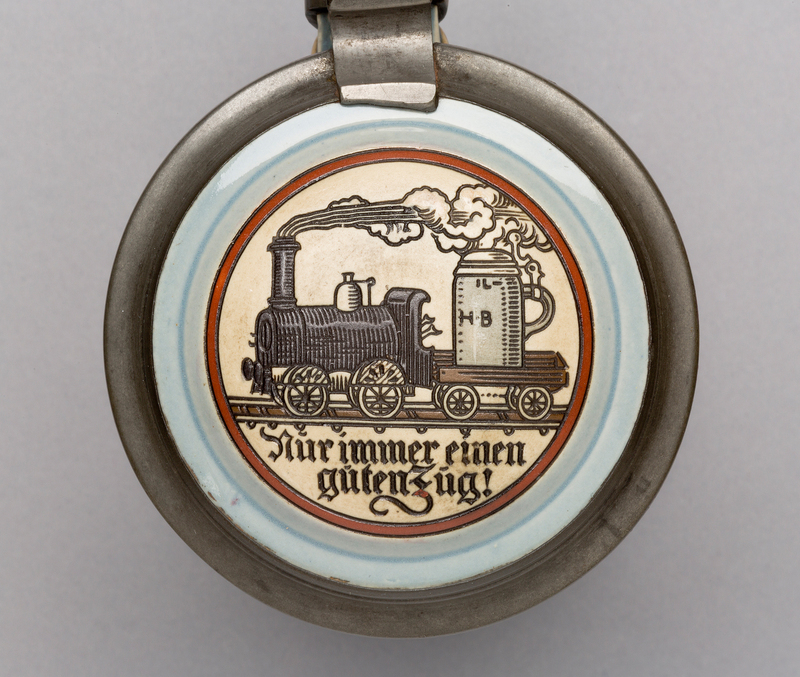 On the lid is a ceramic inlay that shows a train engine hard at work with the motto “Nur immer einen gutne Zug!”. This is a pun. In this context, it means “always a good draught,” but zug in German also means train, so it refers to both the beer and the railroad. Appropriately enough, the train is hauling a giant stein! With the fun and camaraderie that comes with drinking, it is not a surprise that decorations on steins are often meant to get a laugh (remember our Meissen Bacchus tankard!). Next time, we’ll look at more examples of Mettlach with humorous imagery. 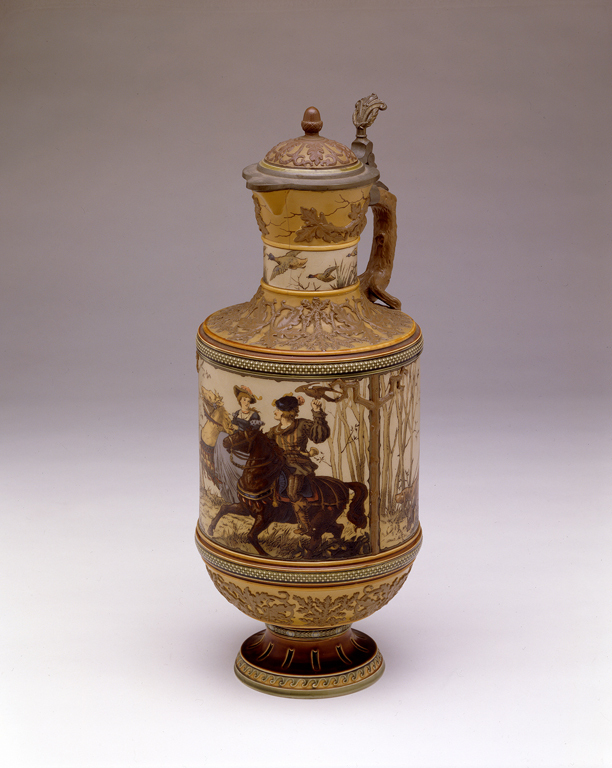 This entry was posted in Art, Curatorial and tagged From the Collection, German Art, steins. Bookmark the permalink.